Through an agreement between Yale's Beinecke Rare Book and Manuscript Library and Humboldt State University's Library, 740 images from the Peter Palmquist Collection at the Beinecke were digitized there and then cataloged at the HSU Library. Some highlights of this digital collection are: Highway 101 and landscape views from the 1940s, a fire engulfing the Sound Lumber Co. in Arcata in 1965, main streets of many of the region's smaller communities, "auto camp" businesses catering to tourists on the Redwood Highway, national figures campaigning in the area such as Robert Kennedy and Barry Goldwater, industrial activity on Humboldt Bay, and images of Hoopa from Nellie McGraw's circa 1901 photo album. Several batches of images were taken by Palmquist himself. Peter was a professional photographer; his artistic and technical abilities are evident in his images. Until now Palmquist's images have not been widely available in his home region. Open for research. Search the collection and view the images on the Humboldt Room Photograph Collections page. Copyright was not transferred to the HSU Library; Beinecke Rare Book and Manuscript Library at Yale University is the owner of the items digitized for this collection. Through an agreement between Beinecke Rare Book and Manuscript Library at Yale University and Humboldt State University Library arranged by George Miles (Yale) and Edie Butler (HSU) 740 images were digitized at the Beinecke and then cataloged at HSU. Edie Butler's travel and research expenses were supported by Humboldt State University Library and the Peter E. Palmquist Fund at the Humboldt Area Foundation. Peter Palmquist spent his early years in Oakland, California, then moved to Humboldt County. The family lived outside Ferndale where Peter attended a one room elementary school. Starting at age 12 he taught himself photography. He graduated from Ferndale High School and then enlisted in the United State Army. While he was stationed in Paris with the Supreme Headquarters Allied Powers Europe, he continued his study of photography and began his professional work as photographer. When he returned to Humboldt County, bringing his young family, he attended Humboldt State College and was employed as the official university photographer. He held that position long after his 1965 graduation, finally retiring in 1989. Throughout those years Peter also ran a commercial photography business. Starting in 1971, Palmquist became interested in historical images, an interest that led him in many directions. He died in 2003 immediately after being gravely injured by a hit and run driver. At first his interest in old photographs led to studying the history of his own profession and then the lives of past photographers, but it quickly incorporated an interest in the informational content revealed in a photograph. He started collecting images taken in northwestern California, but this soon broadened out to include other areas and led to a collection of images from all of western North America. Later his interest in women who worked in any aspect of photography led to extensive research in and collecting of photographs by women worldwide. Working with the Women in Photography International Peter developed and served as curator of the Women in Photography International Archive, which was housed at his home in Arcata. Throughout this time Peter generously shared the information he was discovering and collecting through numerous writings, exhibits, presentations, and workshops. “California Photographers: A Personal Account Of Regionalism In Practice” by Peter Palmquist and included in Photographers: A Sourcebook for Historical Research; published by Carl Mautz; 1991. Included here with Mr. Mautz’ permission. Peter E. Palmquist 1936-2003 Booklet distributed at the April 12, 2003 memorial for Peter. Booklet compiled by Pam Mendelsohn. Included here with Ms. Mendelsohn’s permission. Through an agreement between Yale's Beinecke Rare Book and Manuscript Library and Humboldt State University's Library, arranged by George Miles (Yale) and Edie Butler (HSU), 740 images were digitized at the Beinecke Library and then cataloged at the HSU Library. From research conducted in 2010 Butler determined that the Palmquist Collection was rich in images from the mid 20th Century; a time period not well represented in HSU's collections, nor in other Humboldt County repositories. In April 2012, Butler spent two weeks at the Beinecke Library reviewing and selecting images to be digitized. In June 2012 the images arrived at HSU Library where each one was cataloged. Reports on the 2010 and the 2012 research trips are located on the Palmquist collection page. Some highlights of this digital collection are: Highway 101 and landscape views from the 1940s, a fire engulfing the Sound Lumber Co. in Arcata in 1965, main streets of many of the region’s smaller communities, "auto camp" businesses catering to tourists on the Redwood Highway, national figures campaigning in the area such as Robert Kennedy and Barry Goldwater, industrial activity on Humboldt Bay, and images of Hoopa from Nellie McGraw's circa 1901 photo album. Several batches of images were taken by Palmquist himself. Peter was a professional photographer; his artistic and technical abilities are evident in his images. 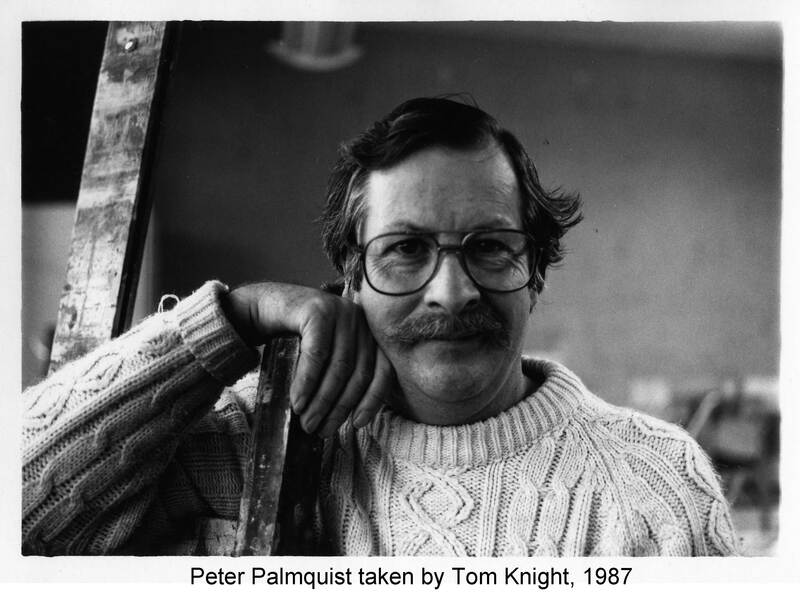 Until now Palmquist's images have not been widely available in his home region. During the 2012 visit to the Beinecke to select the images Edie Butler reviewed images by photographers known to be active during the mid 20th Century. While reviewing box after box of images noting the ones that would fit the criteria of mid 20th Century, Butler also selected some that would nicely supplement existing collections of earlier decades. Beinecke Library personnel digitized the images and Butler cataloged them at HSU. The HSU database records have been made available to the Beinecke Library. The images are arranged in the order in which they were selected. George Miles (at Beinecke) transferred some data to a spread sheet that was then mapped to fields in the HSU Library's photograph database (eg. Beinecke collection and box numbers, photographer) by Steve Mottaz. Edie Butler added information to the photo database record for each image using notes taken at the Beinecke, some information from the versos, and her knowledge of the region and of other photograph collections. Beinecke Library staff used an Epson 10,000XL scanner for digitizing photographs and a Nikon Coolscan 9000 for the negatives. Each image was digitized at 100% of the original object at 400dpi and captured in 24bit RGB color.Images were saved in the Adobe RGB1998 color space. The images were subjectively edited by an experienced photographer (rather than a "color correct" setting on the equipment) to look as much like the original as reasonably possible. For delivery to HSU Library the images were stored on hard drive. Jpeg files were created at HSU Library. Source: For this collection Palmquist/Yale is given as the source although Palmquist obtained images from many different sources. For most images the information about the Palmquist’s source did not accompany the actual photograph. Photographer: Photographer is usually identified because Palmquist organized his collection by photographer. This field is blank for the images for which Palmquist did not know the photographer. Photographer’s Number: These numbers were recorded where they were noted on the image itself. Title: Titles were taken from the image itself, notes found on verso, or were supplied by the cataloger. Titles not directly attributable to the photographer’s studio are bracketed [ ]. In a few instances Palmquist supplied a title for images taken by another photographer and these are noted [ /pp]. Titles created by the cataloger during processing are simply bracketed [ ]. Physical Description and Dimensions: Pixel size for each digital file in included in the Representations Table. Subject/Genre: Subject terms and geographical place names were drawn from lists already in use in the library’s Humboldt County Collection. Names: When a name is known it is recorded in this field or, if only part of the name is known, in the Notes or Comments field. Region: To assist users in locating images from broad geographic areas, a region designation has been assigned from the following map. Numerical values are given to nine areas of Humboldt County, defined primarily by watershed, or by county if outside of Humboldt County. This region categorization is also used in other photographic collections both at HSU Library and at the Humboldt County Historical Society. Notes: Additional information from the image is transcribed in this field. Comments: Additional information about the image in noted in this field. This information is generally about the image itself, or about how it relates to another image. Beinecke Rare Book and Manuscript Library, Yale University, New Haven CT; Peter E. Palmquist Photographic Collection. Humboldt County Historical Society, Eureka, CA; Photocopies of Peter Palmquist’s accumulated notes regarding Male Photographers of Humboldt County, 1850-2000, in 15 bound volumes.